The King of Rock and Roll is famous for his blue suede shoes, but a local woman wants him to be remembered for his relatives who sported gray. Barbara Lee Rowe, who says she's a fourth cousin of Elvis, recently opened a store on Steinwehr Avenue commemorating Elvis' Confederate cousins and uncles who served at the Battle of Gettysburg. The store is something she hopes won't get people all shook up, but will just bring another dimension to Civil War history. She thinks her cousin can bring excitement and interest to the stodgy history of the battle. "I hope the store will bring Elvis into American history where he belongs," Rowe said. "He is a present day figure who had roots in the Civil War. I'm hoping it will help them find more of an interest." The store is small for now, but Rowe said it's doing great business so far. Elvis DVDs, decorative plates, candle holders and T-Shirts are strewn across the walls and on the shelves. Rowe also has a section for POW and MIA products, to commemorate Presley relatives who were prisoners of war. She also sells framed photographs taken by Ed Bonja, Elvis' official photographer. Rowe has always been interested in history. It's part of the reason she moved to Gettysburg three years ago, she said. She thinks of Gettysburg as a living classroom and thinks Elvis' popularity will fuel Civil War scholarship. in the hype, Rowe said. Since then, Rowe has contacted Elvis' other cousins and participated in DNA tests to prove the link between them. And she started tracing the Presley family back as far as she could. Rowe says Elvis is related to Confederate Gen. John Bell Hood, who lost use of left arm when he was wounded at Gettysburg. Hood was the cousin to Elvis' grandmother, Rowe said. In a black binder with shiny silver text saying "Elvis' Family," Rowe has pages and pages of enlisted Presley kin from the Civil War. But she's proven Elvis' connection to only some of them, like Darlin Presley of the 26th North Carolina, who fought in Pickett's Charge and was taken prisoner. He later died at Point Lookout Prison in Maryland. 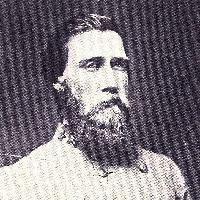 Horton Presley, of the 55th North Carolina infantry also served at Gettysburg and is related to Elvis. "Confederate Americans are Americans too," Rowe said. "He knew he had Confederate ancestors and he was proud of it. But he was also proud to be an American. He would have put it in the proper perspective." Famous for his sideburns, slicked-back hair and gyrating dance moves, it's hard to imagine Elvis' forebearers with bayonets and beards. But Rowe said many Presleys shared his characteristic blue eyes and brown hair, a family trait. And Elvis served in the military as well. He was drafted and served in Germany during the peak of his career. Rowe wasn't a die-hard Elvis fan when she was growing up, she said, though that's hard to believe it coming from a woman wearing a blue T-shirt with a gigantic picture of Elvis' face on the front. Instead, the only Elvis memories she really has from her childhood in New York are eating peanut-butter and banana sandwiches, one of Elvis' favorite treats, and going to the drive-in to see his movies. It wasn't until she saw information on her great-grandmother that she saw the Presley name and wondered if she was related to Elvis. It turns out she's related to Elvis' grandfather. And, no, she doesn't think Elvis is still alive. "When people say Elvis is alive, I tell them look at pictures of him at his last concert. It's really scary," Rowe said. She believes Elvis died from ailments that plagued his young body, not from drug abuse. "He was a gift," Rowe said. "He left a special mark and I want to make sure he has a special place in history. He deserves more." The store's name is The Kin of Rock and Roll: Elvis and History and is located at Patriot Point, on Steinwehr Avenue. There will be a raffle for an Ed Bonja portrait, "Elvis for America," on July 3. Tickets are $5 a ticket with a limit of two tickets per person. They will go on sale at the store sometime this week. Come to "A Night With Elvis" on August 19 at 8 p.m. at the Patriot Point Theater for an Elvis impersonator performance. For tickets, call 717-337-0080.